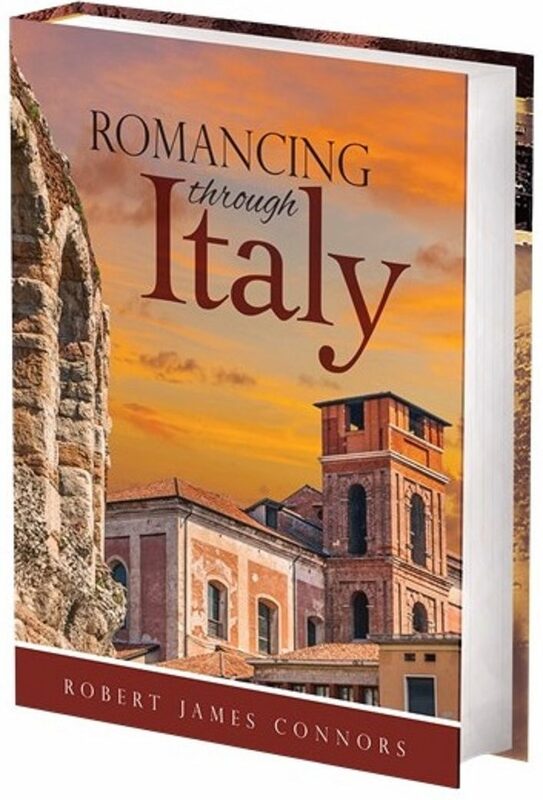 Plumeria Publishing is pleased to announce the release of Romancing Through Italy, Second Edition, in hardbound and softbound format, as well as multiple eBook formats. The second edition contains additional graphics and other visual improvements, as well as minor editing and expansion of textual content. It is available to retailers through Ingram. June 27, 2017 – Italy and its hidden corners and engaging culture are eternally fascinating to arm-chair and experienced travelers alike, and Robert James Connors is among the most knowledgeable experts on that enchanting land. American born, he is an experienced and relaxed public speaker who has spent several years exploring the distant corners of the Italian peninsula, uncovering relatively-unknown places such as the ‘Park of Monsters’ and the Ghost City of Craco. He is also very familiar, of course, with the popular destinations such as Venice and Rome, and will readily share stories of recommended restaurants, and out-of-the-way places to visit. Proficient in Italian, the author relates the experience of standing atop Europe’s highest peak, and diving into the buried palace of the Emperor Nero. From the steaming maw of Mount Vesuvius to the enchanting Isle of Capri, he is available to answer caller’s questions, or share travel suggestions with writers. Connors is an award-winning writer and author of more than 1,000 news feature and magazine articles and guest columns. His works are available through Plumeria Press. For more information or to arrange an interview, please utilize the contact form on this site, or write directly to rconnorsresearch@gmail.com. June 15, 2017 – Book and travel enthusiasts are invited to attend a special book-launch event on Friday, June 30, when Robert James Connors will speak on his adventures in Italy, and answer audience questions about the best corners of that enticing destination. The event will be held at 207 East Park Avenue, Lake Wales, Florida, mid-way between Tampa and Orlando, beginning at 5:00 p.m. Connors will also be available to personalize copies of his new book.